In the summer of 2014 I had the wonderful opportunity to intern with the National Library of Medicine’s History of Medicine Division. When it came time to complete my academic practicum as an MSLIS candidate at the Catholic University of America (concentration in Cultural Heritage Information Management), I was thrilled by the opportunity to return. This summer, I was given a crash course in library cataloging. 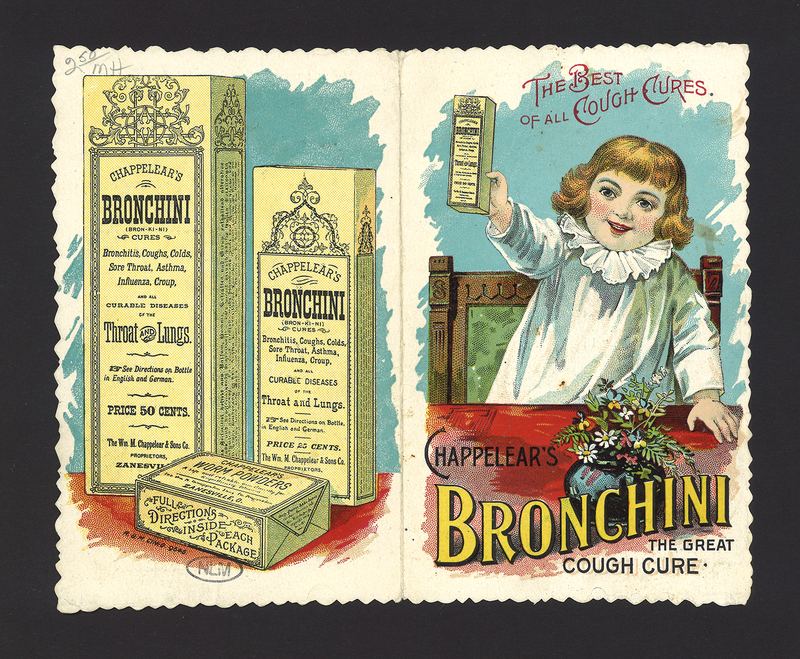 I spent five weeks cataloging medical advertisements and other printed promotional materials from the late 19th and early 20th centuries—all from a collection donated by William H. Helfand. While cataloging was a fascinating experience for the librarian in me, the cultural heritage information that these unique resources contain was truly captivating. What struck me most was the value these materials hold as a window into the public’s historical access to information about medical services. Through case studies, journal articles, and medical texts, we can see how medical professionals treated patients and extrapolate from this how patients perceived and experienced the medical profession. However, such formal sources do not show the whole picture of the public’s experience of “medicine,” which is more muddled and often lies on the fringes of science with information from medical professionals mixing with the claims of quacks and advertisers of nostrums and patent medicines. In 1906, with the Pure Food and Drugs Act, the founding statute of what would become today’s Food and Drug Administration (FDA), the government imposed regulations and medical denouncements of nostrums (those pills, ointments, and tonics that falsely claim miraculous cures for all manner of ailments and generally misrepresent ingredients) that had begun to gain traction at the turn of the 20th century. This increasing scrutiny caused a clear and demonstrable shift in the public’s relationship with medicine that can be seen quite clearly through the marketing and promotional materials from that era. Take, for instance, Father John’s Medicine. In 1915, the Carleton & Hovey Company faced grave consequences for misrepresenting the drug’s health benefits. While the advertisement for Father John’s Medicine that I worked with at the NLM was not the most grandiose, it did include those falsified claims for which it would later be condemned. 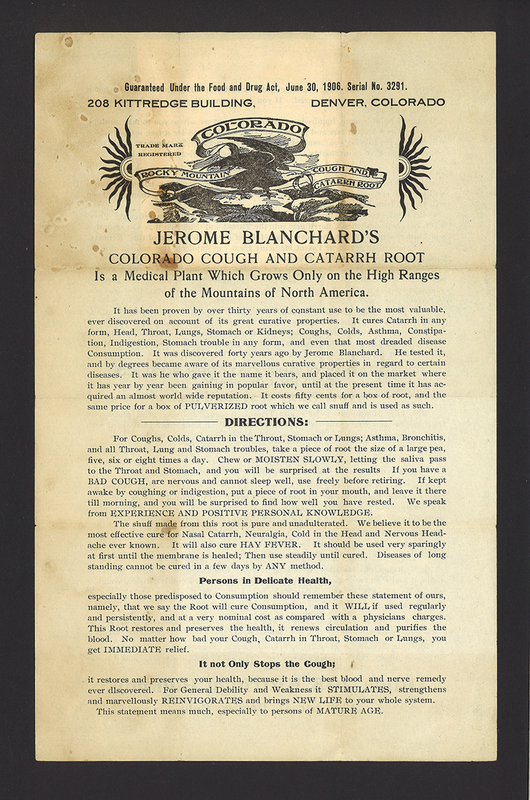 As with most marketing campaigns (and certainly most medical promotional materials of the time), this advertisement was probably experienced as an everyday presence to be encountered at stores, distributed by druggists, delivered to homes, and received from sales agents. Combined with the false curative claims is the imagery of a trusted and ostensibly “good” authority figure (in this case clergyman) as well as his personal testimony about the drug’s success. This sort of imagery, as well as the use of beautiful illustrations, emotional gimmicks, fear mongering, and especially personal testimonies, were all very common elements in the materials that I encountered in my work. In many ways, the public’s experience of this advertisement is not all that foreign to modern consumers. Despite regulations and changes in the delivery media, many of these marketing strategies have parallels with advertisements today. Advertisements are a significant point of interaction between the general public and medical services and products (legitimate or otherwise). They also provide a point of intersection between social history and the scientific history of medicine by illustrating how consumers experienced the world of medicine. They demonstrate the change in that experience following the Food and Drug Administration Act as companies began to change labels and literature to avoid false advertising, altered recipes, and even began referencing the FDA in their promotional materials. Some products, like Father John’s Medicine, managed to adapt to the regulations and are still on the market. Others, like Chappelear’s Bronchini, appear to have vanished into history. But the legacy of these advertisements for medical nostrums continues, and in them we have an invaluable window into the general public’s experience of medicine. Kelsey Conway is a MSLIS candidate at the Catholic University of America (concentration in Cultural Heritage Information Management). She was a Pathways Intern at the National Library of Medicine during summer of 2014; during this past summer she has been a volunteer intern doing a practicum for her degree. Your comment that ” the publics experience with medicine often lies on the fringes of science with information from medical professionals mixing with the claims of quacks and advertisers of patent remedies” is analogous to the present day situation with Dr. Oz. Thank you for an informative article.. Simply put, when reading or hearing any claim of a medicinal or device beware of the word ” miracle”. I am sorry about your headaches. It reminds me of an old medical aphorism that if a patient tells you that his headache is the worst that he has ever experienced he must be carefully and promptly evaluated for an intracranial bleed. A simple unenhanced brain CT can usually be obtained readily on an emergency basis. Chronic headaches are of course the usual situation and do not mandate a sense of urgency.